Alice Bear Shop Book Captains Treasure Discounts Apply ! Captain's Treasure Captain is a cat of considerable character, whose possible pirate past comes in handy when solving a mystery. 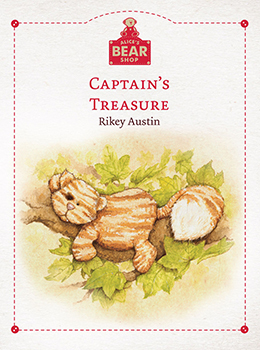 Follow Captain's story from patient at Alice's Bear Shop and Hospital for Poorly Bears to the hero of Alice's family. Written and beautifully illustrated by Rikey Austin, the storybooks invite children of all ages into the wonderful world of Alice's Bear Shop (and hospital for poorly bears) where the characters invariably end up either to be repaired or returned to their owners.